This is exactly what I wrote but then clicked the wrong button and it was all gone AUD and CAD look more vulnerable at present with softer “hard” commodities and oil. And let’s not forget about end of Q2 and H1 of 2011 ahead of long US weekend. Extra volatility guaranteed included Greece. Next week could be pivotal for the future as big players start H2 2011 IMHO. Now that you mention it, I’m really convinced we’re in for some crazy moves! I totally forgot about that long weekend though. Maybe we’ll see a lot of profit-taking before the end of the week then? A midweek reversal perhaps? that Kiwi learned to fly! Looks like you’re right about the selling the news part! Those wicks aren’t looking good for the Kiwi right now. You have any positions on? Q2 GDP is due next week. I will do some research on how it progressed as it could have a significant impact on the pair. I’m keeping an eye out for that GDP release, too. Could be a big mover. Let us know if you have any setups for playing this report, all right? Happy pipping! GDP data (which is Q1 not Q2 as I wrote earlier) has been delayed for another week to July 14. According to NZ Herald Statistics New Zealand, the government statistician needs more time to analyse the data having previously pushed out the scheduled June 23 release after the Canterbury earthquakes, which have severely damaged its Christchurch office. I’d second that - am staying out until we see some sort of retracement, then take a view on whether that is a trend reversal ahead of shorting opportunities, or simply a retracement within the overall uptrend. I am certainly waiting until the Support around 0.8100 or even 0.8000 is tested. Same here! I’m marking my calendar for the July 14 release though, since this could push the Kiwi in a clearer direction. Hmm, pretty quiet in my comdoll corners lately. Don’t tell me y’all are also spent the last few days re-reading the Harry Potter books like I did! How’s everyone doing so far? reading the Harry Potter books like I did! How’s everyone doing so far? Took a few days out having made some pips on the back of the recent craziness elsewhere, but am back in the saddle now. Obviously lots of news around at the moment, not least today, but we are currently at an all-time high for this pair - could be interesting to go short if today’s bar on the Daily closes as a high test. Certainly one I am looking at, at the moment. 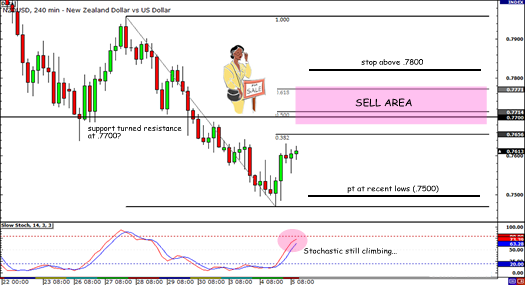 What do you think of this NZD/USD retracement play? The pair has been on a strong downtrend lately and there could be a chance to hop in on the retracement to the 61.8% Fib. That lines up with the former support level around .8725. Stochastic still hasn’t crossed nor reached overbought, which means there could be still room for the pair to climb. That red candle is tempting though… Should I short at market or wait for it to reach .8275? Good morning happypip. Is that an Hourly chart? I absolutely see what you are saying, but the Daily and 240 charts make me nervous. 0.8000 is a major level of Support, and each chart has low-tested out of it. There will be people looking at the low test on the Daily as a reason to go Long. There is often a correlation to AUD/USD, though, and obviously that is dropping, so I am not seeing a clear signal. Had the Hourly high-tested I might have looked for a short-term Short, but personally I am just finding the picture too mixed to see a clean setup. It is pretty slim pickings all round, at the moment. If the Kiwi closes today as a low test on the Daily then there will be a lot of long orders placed. So much as we had with AUD a couple of weeks ago, I am going to wait for a clearer direction to emerge. If you do want to go short, then certainly the 0.8275 figure you mention is at the Daily Pivot, so is an area where Price could react. But as I say, I am not going short with the Daily as it is currently. Sorry to sound like an old stick-in-the-mud!! I’m ‘only’ 37!! I just figure that I really don’t need that many setups in a month to make some good money, so I don’t like a mixed picture. Hahaha, it’s cool SimonTemplar! I definitely appreciate your longer-term thoughts on this pair, especially since I tend to forget to look at the daily charts for the overall trend. I just thought I’d get a quick scalp trade from this, but it’s a good thing I didn’t short because it just busted through those Fib levels I drew! Hmm, pretty quiet again in this corner. Any trade ideas out there? It seems that comdolls are consolidating pre-NFP. Do you guys think that US report will be pro-USD or anti-USD? Like it. I have this Pair on my watchlist, currently, looking at the same move: I have a 50ema on my chart, and the 240 gave up a nice short opportunity on 27th September, a doji at 4pm (UK); am currently hoping for a retrace back to the 50ema for a similar opportunity (although also watching AUD/USD to see whether that conflicts). Tough to predict ema’s (by definition lol) but the intersection, if it happens, could be around 0.7680, so looks as though the idea lines up with yours, albeit by a slightly different route. Eep, it didn’t turned out so well for me though. Blasted NFP! Yes, sorry about that - it was always a bold moving, trading through an NFP ahead of a Bank Holiday, that generally means a lot of volatility, so I stayed out. But boldness in this game can make a lot of money when played right and consistently, so that approach could make you your fortune!! I never took the trade, bit flat at the moment, tried shorting AUD from Parity off the 240 but pulled it as it stalled. Anyway, sorry about the losing trade, plenty more fish in the sea! !